Every student wants to find a unique Mother’s Day gift that will stand out from the rest and will be received with the enthusiasm teacher hopes for. You know flowers have become one of the most popular gifts On Mother’s Day but they are too cliche. This article introduces a unusual Mother’s Day Bouquet that our teacher must be interested in it. This is candy covered strawberry roses, they made from candy melt dipped strawberries and put together in an elegant bouquet will always be received with surprise and love on Mother’s Day. You may also love them for they are so lovely and it easily be made at home and won’t cost us a fortune, so it is suitable for every student if you want to make this colorful and tasty bouquet like this. Now let me tell you how to make the unusual Mother’s Day Bouquets. First, wash and dry the strawberries with a paper towel, otherwise the candy melt won’t stick to them, because the water will change the emulsion. 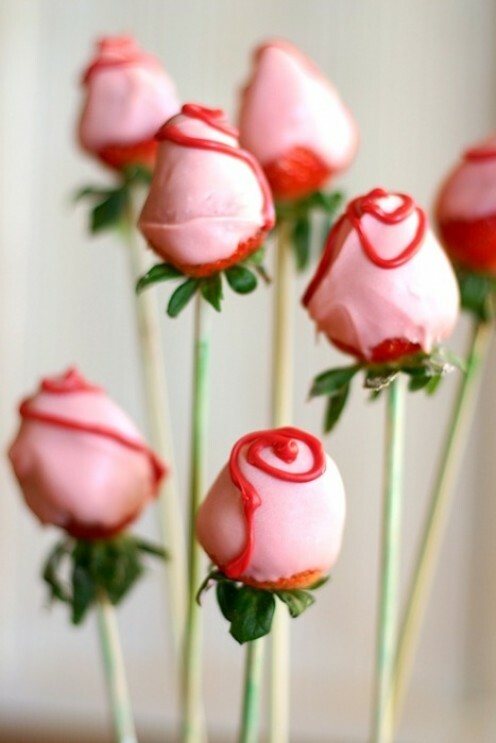 Insert a skewer in the stem end of each strawberry, but not all the way through – just enough to secure it. Put your “base color” candy in the microwave and melt it in 30 second intervals. You can choose any kind of color you want – red, orange, yellow or pink. The best is to pick your teacher’s favorite. Dip the strawberries into the melted candy and then stick the skewers upright into the Styrofoam block. Wait until the candy melt is hardened. Microwave the “decorating color” candy melts and put the melt in a Ziploc bag. Get your little brother’s tiny scissors, snip off one of the corners of the bag and draw an expanding spiral, starting from the top of each strawberry. Make sure you pick a candy color that goes well with the “base color”. If you made your “roses” red, decorate them with pink. If you made them yellow, decorate them with orange and so on. Twist the colored paper you can choose green, brown and others around the bamboo skewers to let your candy covered strawberry roses more like beautiful roses. Can you make them? Now lay the strawberry roses in a pretty box with a ribbon and give it to your teacher for Mother’s Day. Trust me, this will be very wonderful teacher appreciation gift ideas in their life.